Petition: Save the World's Newest Great Ape From Extinction! Save the World's Newest Great Ape From Extinction! Just a few months ago, scientists discovered a brand new species of great ape living in northern Sumatra. Sadly, the Tapanuli orangutan is already endangered, with fewer than 800 individuals in existence. And now, a company called Sinohydro is planning to build a hydrodam right in the middle of where the Tapanuli orangutan population lives -- putting the new orangutan species at even more risk. The Indonesian government has approved the Batang Toru dam, even though it violates their own laws, which prohibit activity that would harm a protected species. The Tapanuli orangutan is a protected species, and the proposed hydrodam would absolutely harm them by destroying their habitat. On top of that, the dam would cut down the center of the region, splitting up the already small population into two even smaller populations, further hurting their chances for survival. The dam will also increase human activity in the area, increasing hunting and other human-wildlife conflicts. With just 800 individuals, the Tapanuli orangutan cannot afford to lose any more of its population, but that will certainly happen if the dam is built. 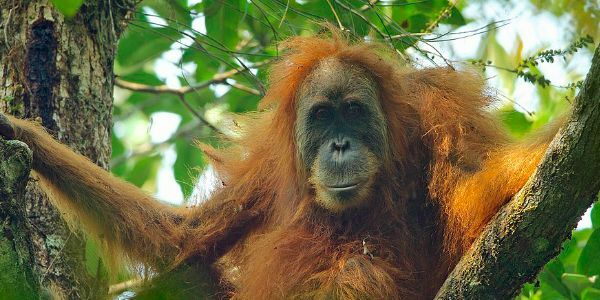 Please sign this petition urging the Indonesian government to save the Tapanuli orangutan by revoking approval of Sinohydro's Batang Toru dam! Right now, multinational corporation Jardines stands by as forest clearing begins in the orangutans' only habitat. Join Mighty Earth to protest on Thurs 21 March in London or in NYC. Jardines also owns one of Indonesia's largest companies so they have the influence needed to help stop the dam.